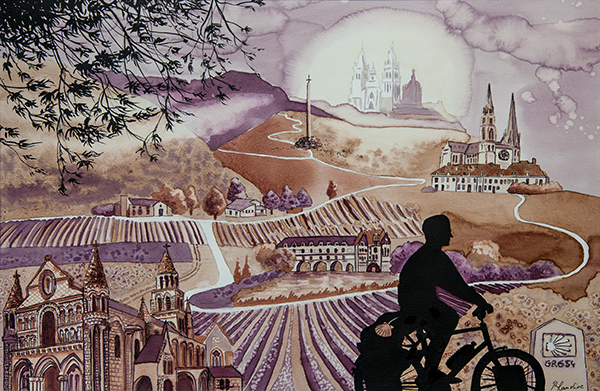 I have painted this vinorel for a cyclist rising to Santiago de Compostela. You can see several places on the road from France to Compsotela like Chartres, Notre Dame de Poitier, the castle of Chenonceau, winegards of Bordeaux, the Pyrenees with ” la breche Roland” . The wines I have used are also to find on this road from the Netherlands where my customer starts his trip (Dassemus Wijngaard), to France with a Bergerac blanc and a Saint-Emilion and to Spain with a Senorio de Saaria (Finca Puente la Reina). This vinorel combines the passions of my customer: bicycle, France, wine and Spain.